Und noch eine Kullerkarte ist mir vom Tisch gehüpft. Auch hier habe ich den Himmel mit dem Schneeflockenstempel von Make it Crafty mit Versa Mark bestempelt und dann embosst. Der knuffige Schneemann stammt aus dem Snow Angel Set von Gerda Steiner, natürlich gibt es auch hierfür eine passende Stanze. Der Kullerweg, ist eine Stanze von My Favorite Things und heißt: Downhill Slope. Auf Fotos sieht man leider nicht richtig wie es kullert. 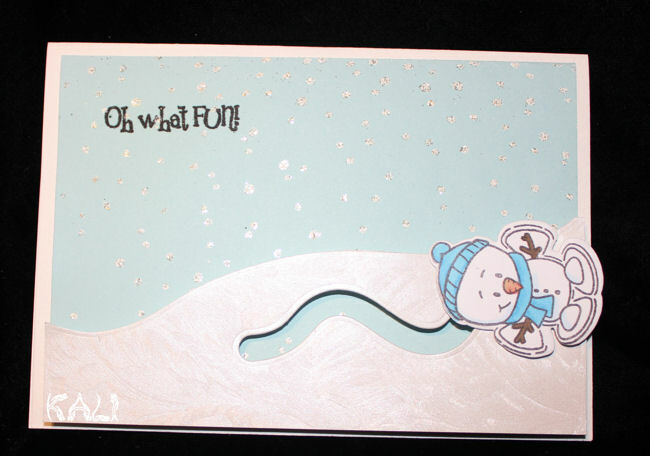 This is such a cute slider card and the snowman is perfect! 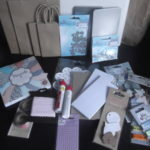 Thank you for joining us at the Crafty Sentiments Designs challenge and I hope you’ll be back again soon. What a fun love the slider element. Oh this is so much fun!! This is really awsome! Love the slider! What a cute way to do a snowman card! Love it! Haha! He really looks like he is sliding down the hill and having fun. The sentiment is perfect. What fun, for sure, Kali! This is such a great idea for our challenge this week – thanks for joining us at the Simon Says Stamp Wednesday challenge! A fun card. Penny slider cards are great. Glad you stopped by at 613 Avenue Create . Very sweet card. Thanks for joining us at Card Mania Challenges. Good luck and hope you’ll join us again.